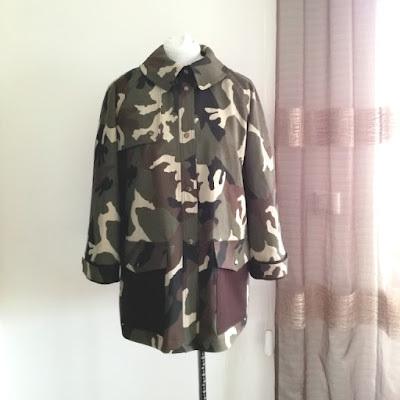 EN Summary: I decided to make myself a military parka using a BurdaStyle pattern from their latest issue (BurdaStyle 2019/04, model 102B). Keep reading the full article (consider disabling ad-blocker to support this blog). PT Sumário: Decidi fazer uma parka estilo militar usando um molde da revista BurdaStyle deste mês (BurdaStyle 2019/04, modelo 102B). Continuem a ler o artigo completo e, se quiserem apoiar o trabalho que faço aqui, desativem o bloqueador de anúncios. 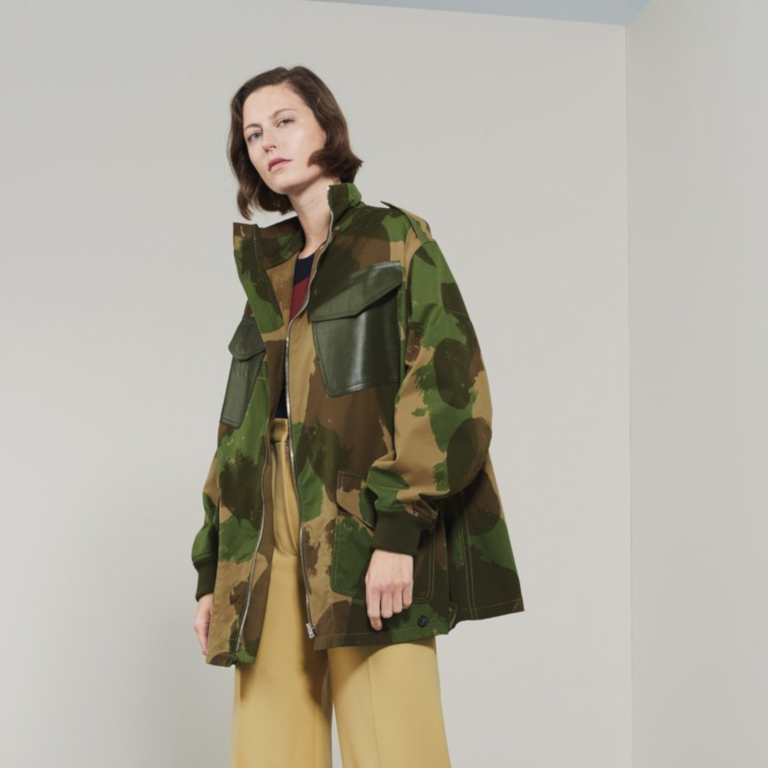 EN: I was seduced by this safari style jacket as soon as I saw it; I noticed the design of the collar (I remember seeing similar collars on some Chanel tweed jackets) and the large patch pockets very much on trend right now. I also loved the 3/4 sleeves with narrow cuffs and tabs. PT: Esta jaqueta estilo safari seduziu-me à primeira vista; aforma da gola chamou-me logo à atenção por me lembrar as golas de algumas jaquetas de tweed da Chanel e os bolsos de chapa grandes estão muito na moda agora. Também me agradam as mangas 3/4 com punhos estreitos e presilhas. EN: I confess liking the BurdaStyle shape even more, so I decided to stick with it, yet I kept some details inspired by VB's parka, like the patch pockets in brown color. I also traced the pattern one size bigger that my usual size, to achieve the over-sized look very much on trend now. 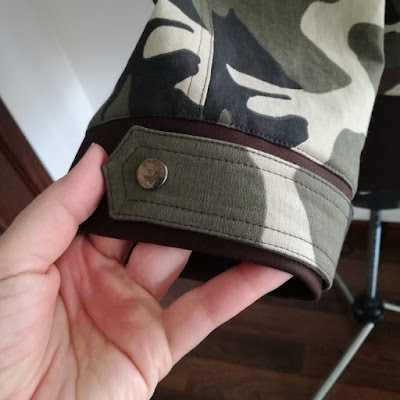 PT: Confesso que o design da jaqueta BurdaStyle me agradou ainda mais, por isso decidi não o alterar, no entanto mantive alguns detalhes da jaqueta da VB, como os bolsos de chapa em castanho. Também cortei o molde num tamanho acima para um efeito mais "oversize", de acordo com as tendências no momento. 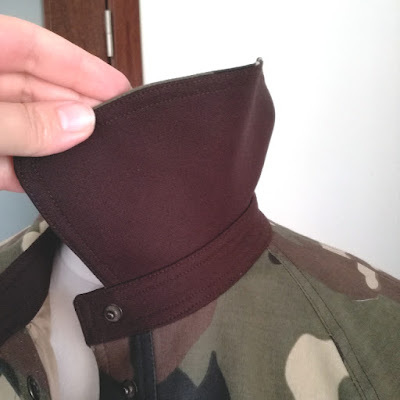 EN: Here's the collar detail; notice how the under-collar and the collar stand were cut on the brown contrasting fabric, to match the pockets. Also notice I used snap fasteners instead of buttons; I am lucky to have inherited a snap installation tool (along with a stash of snaps!) from my maternal grandfather! PT: Aqui têm o detalhe da gola; notem que a gola inferior e o pé da gola foram cortados do tecido castanho. Notem também que usei molas de pressão em vez de botões; tenho um torno especial que aplica estas molas, herdado do meu avô materno, juntamente com uma boa quantidade de molas para aplicar! EN: One thing I did differently from the BurdaStyle original was adding a full lining (I used different colors just to make use of the lining remnants in my stash, and I think it turned out great together with the camouflage print). To cut the lining I used the back pattern piece allowing for a 3/4" deep wearing ease fold on the center back instead of a seam, and 3/8" hem allowance; the front pieces were cut as they were, also with 3/4" hem allowance; the sleeve pieces were cut with a larger 3/4" hem allowance so they could form a wearing ease pleat when attached to the cuffs together with the fabric sleeves. PT: Uma coisa que fiz diferente do original da revista BurdaStyle foi adicionar um forro total na parka (usei cores de forro diferentes simplesmente para aproveitar os restos de forro que tinha lá por casa; acho que até resultou muito bem com o camuflado). 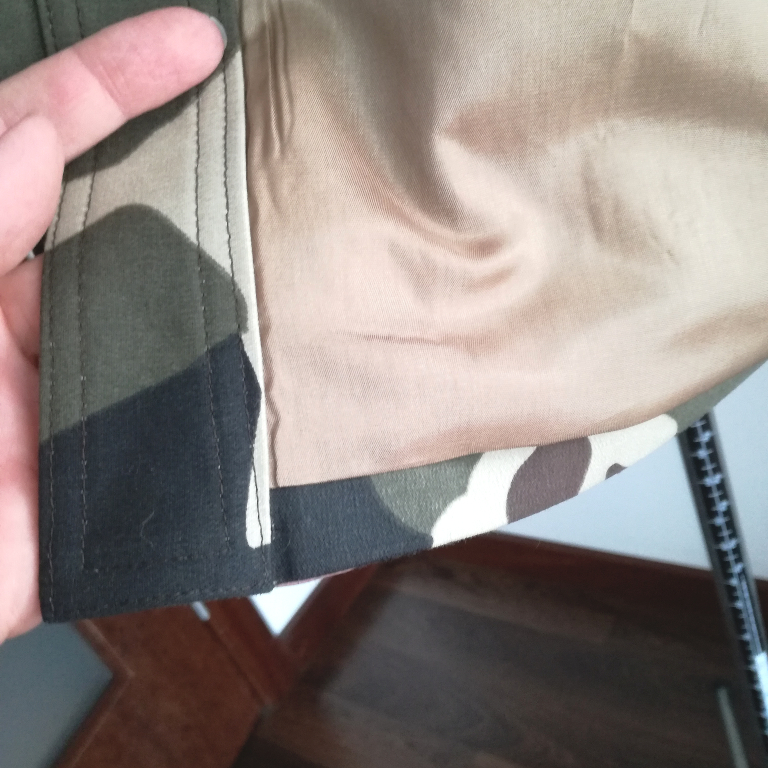 Para cortar o forro, usei o molde das costas mas em vez de costura no meio de trás, criei uma prega de folga com cerca de 2cm de profundidade; também acrescentei apenas 1cm de margem de bainha (em vez dos 4cm nas mesmas peças em tecido). 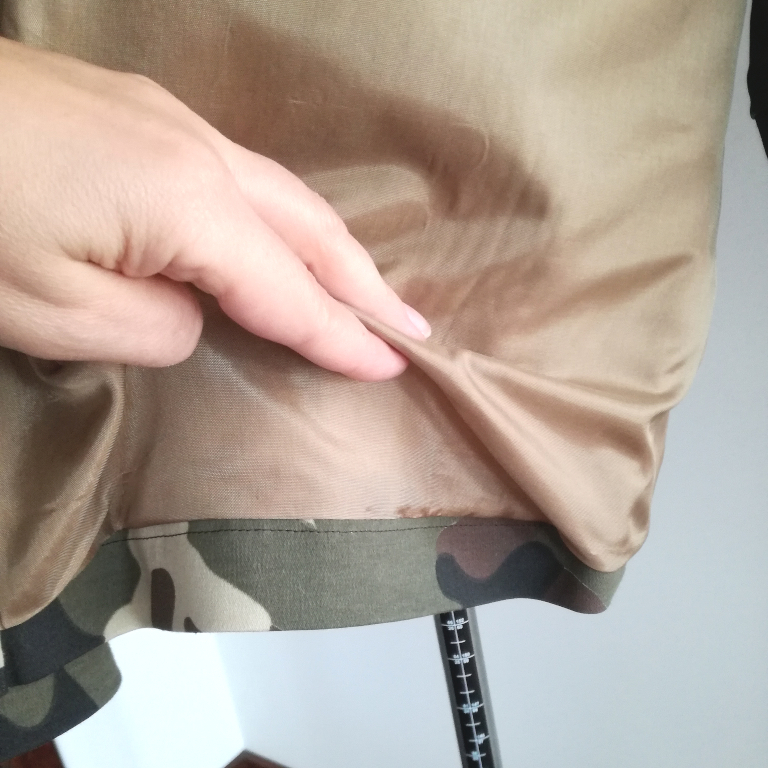 As frentes foram cortadas tal e qual, com os suplementos de bainha de 1cm, e as mangas com suplementos de bainha um pouco maiores (2cm) para formar uma prega quando a manga em forro se cose ao punho juntamente com a manga em tecido. 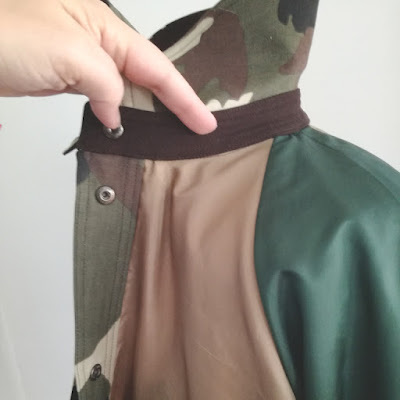 EN: In fact the lining is stitched to the parka's hem allowance first, then the parka's hem is top-stitched and basted along the front edge forming a wearing ease pleat at the hem. Next the placket is installed, then the cuffs, and finally the collar is set in. PT: De facto o forro primeiro é cosido à margem de bainha da parka, sendo esta margem depois pespontada rente a esta costura. As orlas da frente da parka e da jaqueta são alinhavadas juntas, formando a prega junto a bainha, e só depois é aplicada a carcela. Em seguida cosem-se os punhos às mangas em tecido e forro ao mesmo tempo, e a gola é a última peça a montar. EN: Lifting the wearing ease hem pleat on the lining will reveal the hem top-stitching on the wrong side, which remains hidden by the lining hem pleat. 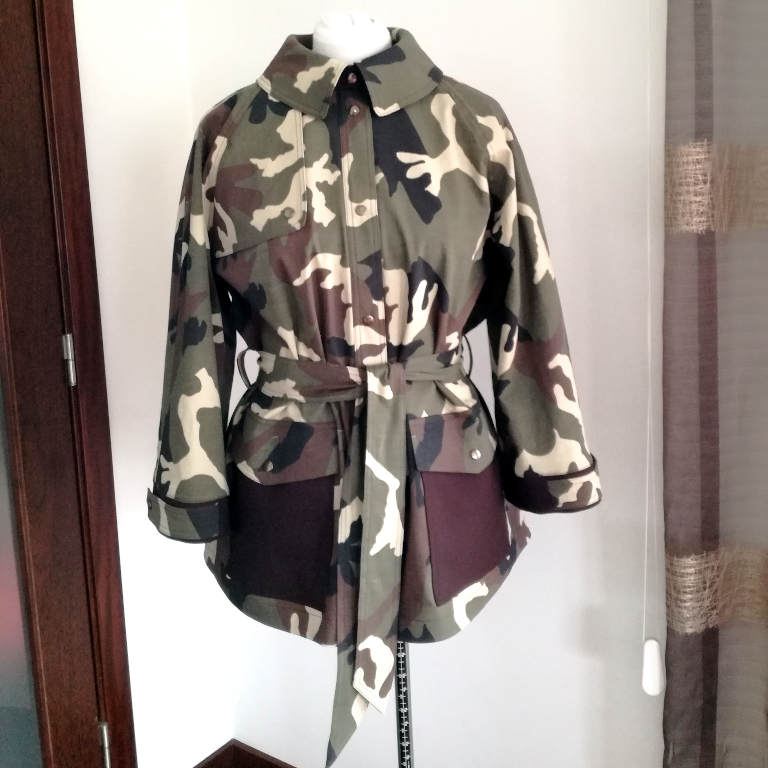 EN: This is it, I hope you all get inspired to sew some military or safari inspired garments as I did! Thank you all so much for visiting and for the lovely comments! 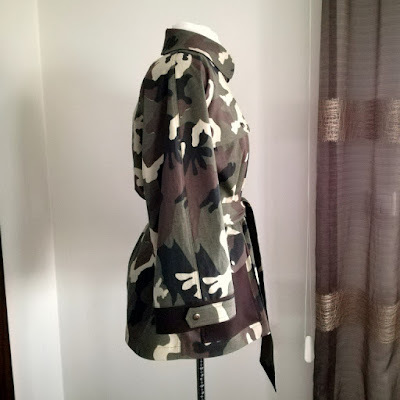 PT: E é tudo, espero que se sintam inspirados a coser peças de inspiração militar ou safari como eu! Muito obrigada a todos por aparecerem, apoiarem e pelos simpáticos comentários! interesting that I don't usually like camo fabric but this is fantastic, love the details of the brown contrast fabric. I noticed that pattern but didn't see it as versatile - but it is. Tany, I am always amazed by your talent. You stitch works of art! Not a fan of camo or the style really. However I am amazed at your skill as usual. Love the mix of the brown on the cuffs and collar. How will you style it? Thank you all for the lovely comments! 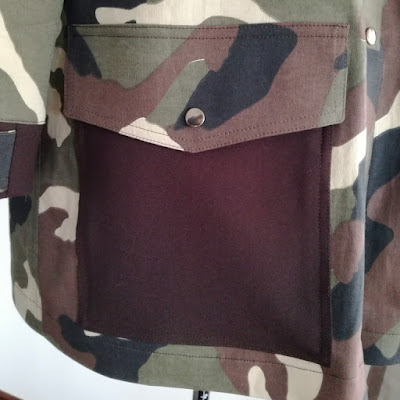 Vicki, I plan on making a matching pair of pants in brown (perhaps not the same brown fabric used on the jacket but a lighter brown) with camo print pockets, yet I believe this jacket will look good with jeans and a white t-shirt. 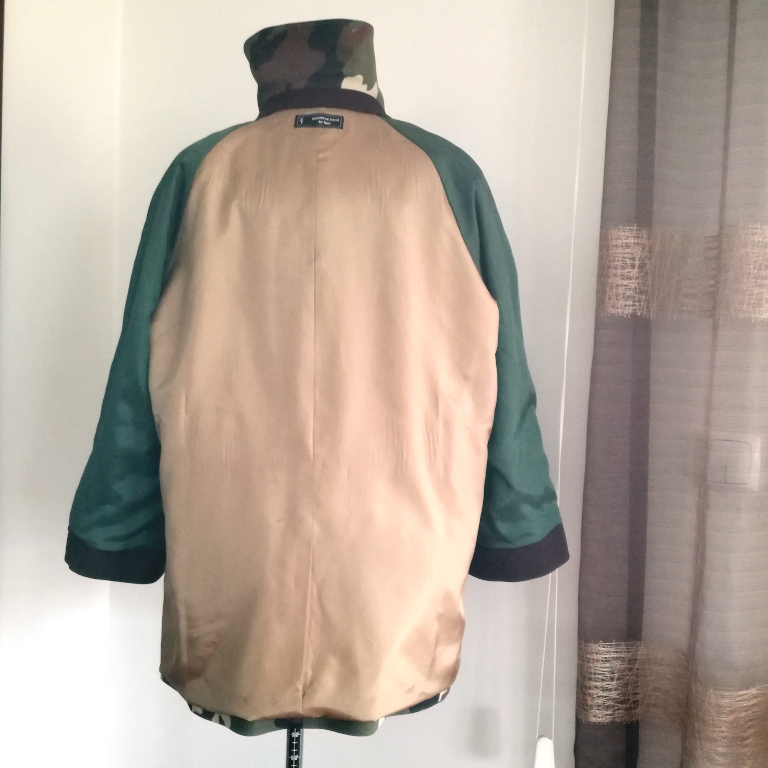 Other options are all white, beige, khaki or brown separates. what an unusual inheritance to receive from your grandfather !! 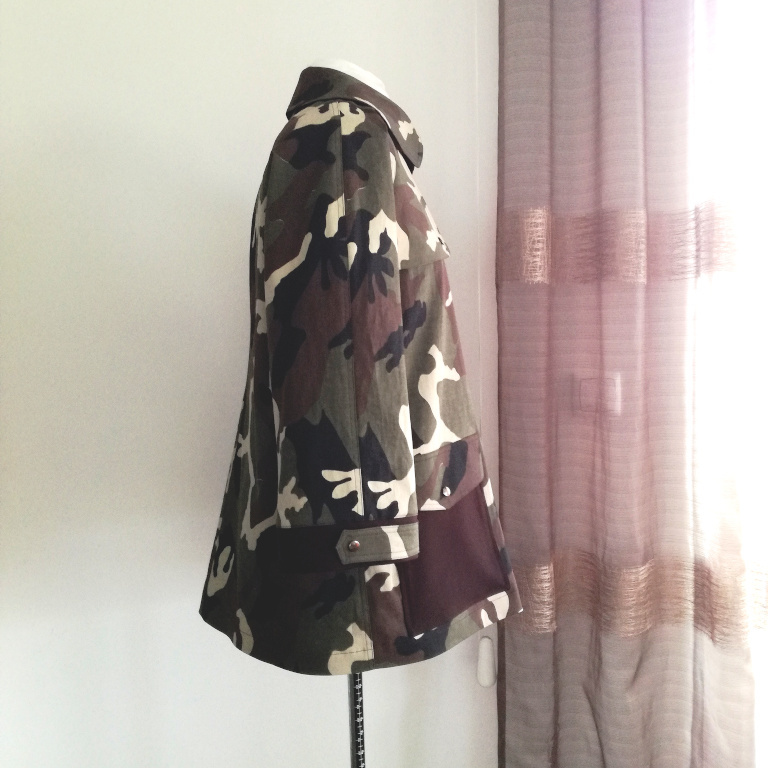 I don't usually like Cammo but this looks great and you have certainly done a great job making it as usual. ! I am not a camo fan either, but this jacket is fabulous. 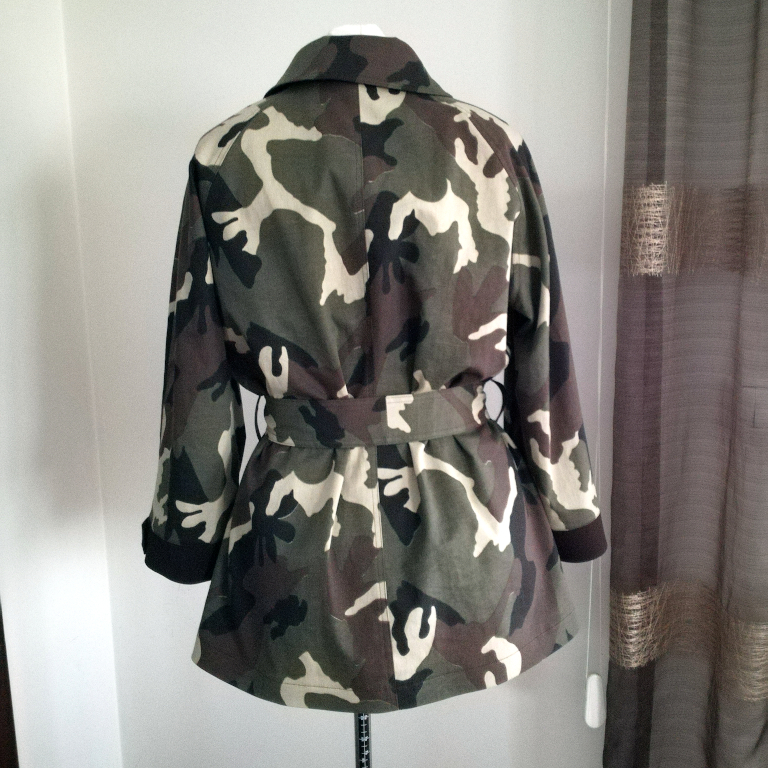 I am about to muslin this jacket and it was great to see your details close up. 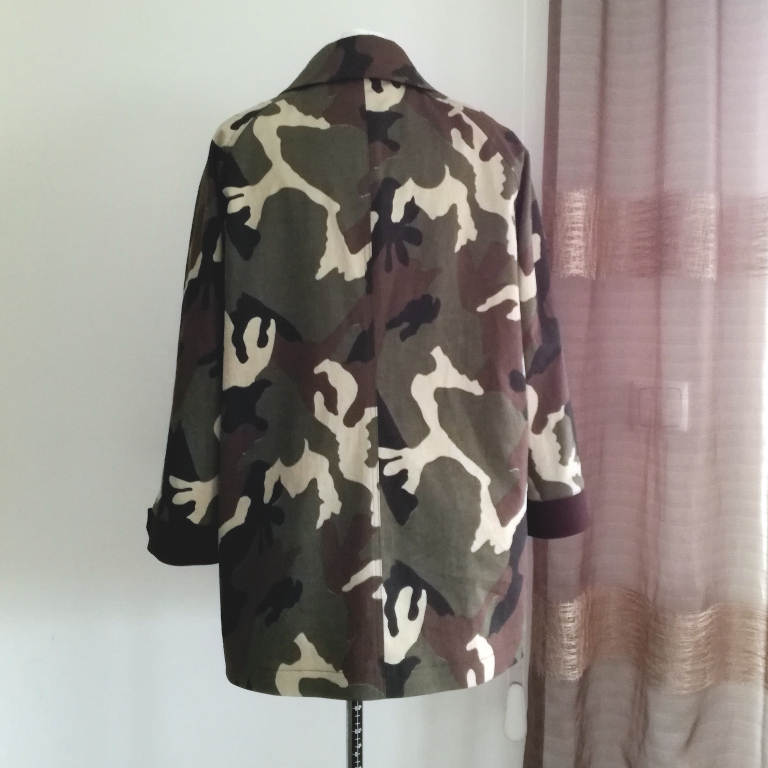 I admire your version of the camo jacket. Lucky you to find a fashion version of the print. 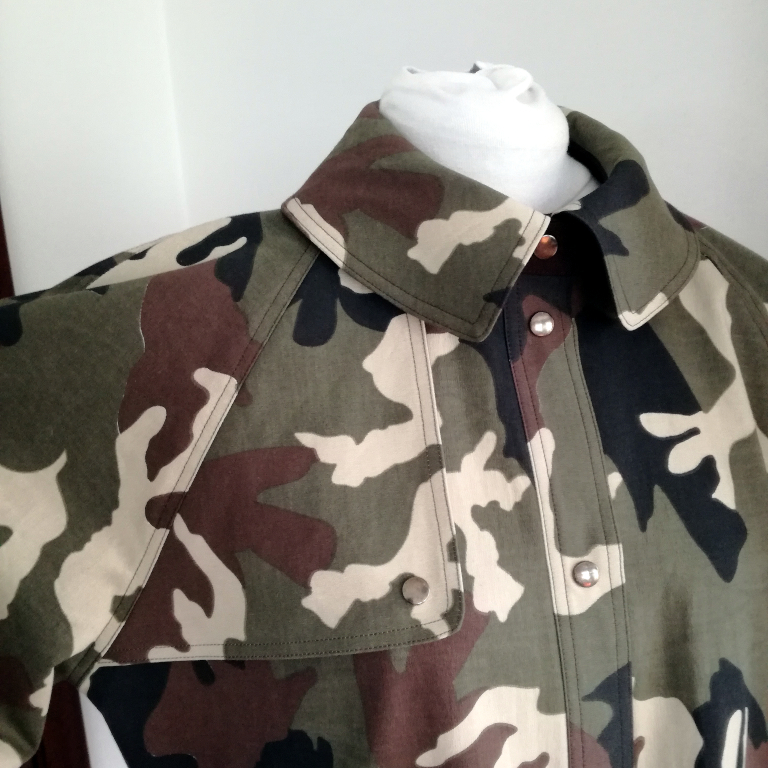 My local fabric stores have it the typical prints used for actual hunting gear. I could never rock it in a fashion way where I live. Too many people actually wearing it in public and from the looks of them (mud covered pickup trucks and dogs) for the purpose of outdoor activities. I love this jacket! I have not been a fan of camo until this year and keep seeing it more and more. Love your fabric and that you used it for this pattern. I am always impressed with your sewing skills. Enjoy wearing it!